I don’t know that there are ever any kids who enjoy bibs. They’re a necessary evil, and in most cases, kids can’t wait to take them off. But for some reason, we adults view bibs as an adorable accessory while also understanding its purpose as a mess-catcher. 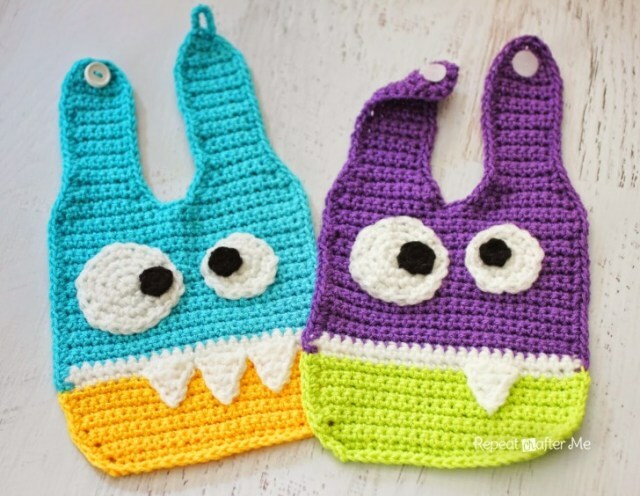 There seems to be a miscommunication between the three year olds who just want to make a mess, and the parents who just want to contain the mess, but I believe I’ve found a middle ground that will please everyone: the crocheted Monster Bib. Although when feeding it might be better to use a feeding bib. Now, I know what you’re thinking. “How practical is a crocheted bib?” Well, if you’re using cotton yarn, it’s easily washable. It will retain more of the mess than a plastic bib, and it won’t feel weird around your kid’s neck (some of us have sensory issues and plastic can make our skin crawl). So, I’d say it’s super practical. Of course, I’d say this is a bib for younger kids (it’s better for liquids like drool, milk, formula, etc. ), but you know, if you want to make one for yourself for the next time you’re eating a stack of ribs, go ahead. Everybody needs to let their inner wild thing loose from time to time. This would also make a great gift for a new parent, along with a copy of a monster-themed book, such as Where The Wild Things Are or The Monster At The End of This Book. You could also include burping cloths, or some clothes with monsters on them. Kids love monsters, and sometimes we adults privately they can be little monsters from time to time (we still love them anyway). 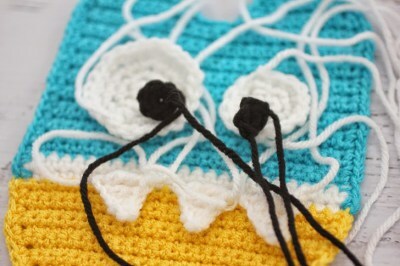 For one monster bib, you’ll need to gather the following materials: yarn (the pattern recommends using the Lion Brand Modern Baby Yarn and some worsted yarn for the details), in two colors for the bib, white and black for the facial embellishments; scissors; a tapestry needle; and a size “H” crochet hook. You’ll also need something to attach the bib together at the back, but you can choose between using velcro or a button closure (velcro is easier but the button closure might be more durable in the long run). This pattern is pretty accessible to all levels of crocheters, whether you’re just beginning or you’ve been crocheting since you yourself were a little one. 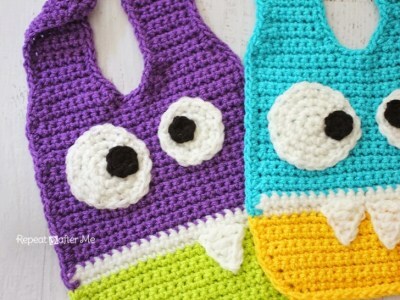 The stitches you’ll need to know for making the monster bib include single crochet (sc), double crochet (dc), triple crochet (tc), half double crochet (hdc), chain (ch), and single crochet decrease (sc decrease). As ever, if you are unfamiliar with a stitch or need some practice beforehand, visit some YouTube channels or your local fiber shop and get comfortable with the stitch before starting this project. You’ll make the body of the monster first, adding on teeth and eyes after completing the bib. The end result is an adorable, kid-friendly little monster who will help them keep the mess at a reasonable level while eating or playing with their food. Does this sound like something you or your child would enjoy? You can find the free pattern at Repeat Crafter Me.